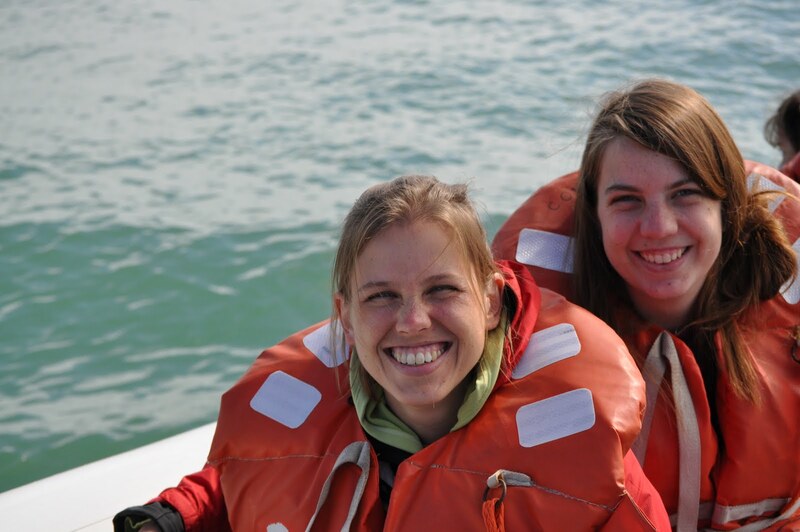 We returned last week from a 10-day journey to Argentina. An amazing week, but we were traveling, as opposed to vacationing. 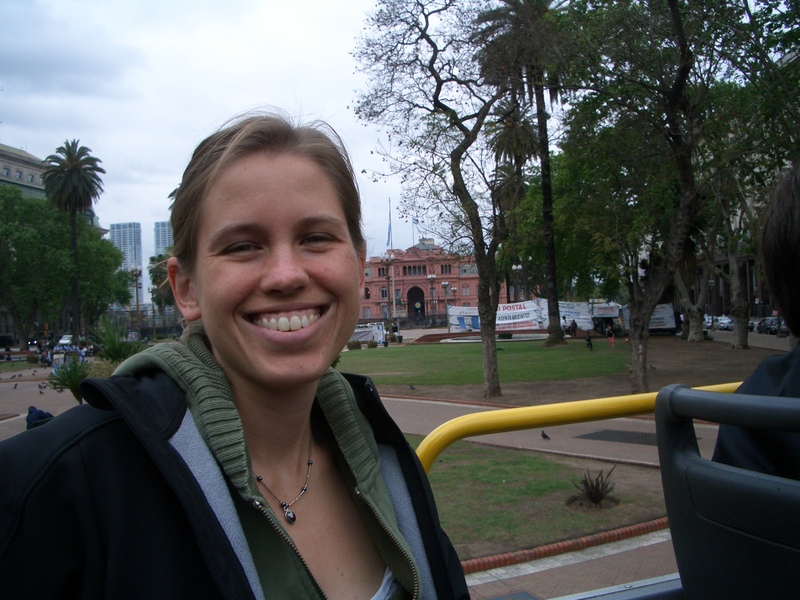 We started our trip in Buenos Aires, where my sister, Kelly, is studying abroad and was willing to serve as our talented tour guide. I knew Buenos Aires was a real city (as opposed to a quaint Latin-American town), but I had not understood that it is significantly larger than New York City. So, more than anything, it feels like a big city. There are about four Argentinian pesos in a US dollar, but prices are generally adjusted upwards, so things seem to cost about what they might cost in the United States, though less than what they cost in New York City. 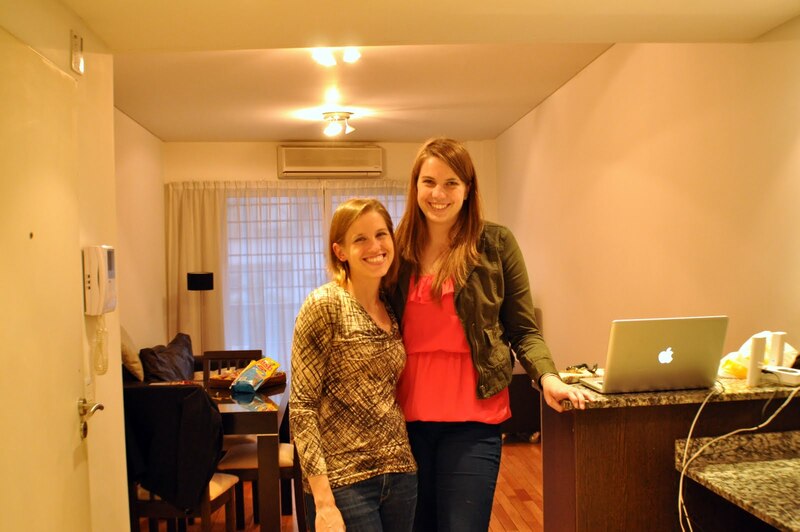 Thanks to Kelly’s great advice, we rented an apartment for the week through Flats in Buenos Aires, which worked out well — though as a note to readers, read your contract carefully — you need to have lots of USD on hand for the rental fee and deposit when you get into downtown Buenos Aires. We stayed in a beautiful area, Las Canitas, full of cafes, restaurants, shops and parks. We arrived Saturday morning. The first order of business was finding some ATMs in order to compensate for failing to bring enough dollars to pay the deposit on our apartment. Argentinians are very weary of their own currency (there is a great Planet Money podcast on the Argentinean default of 2001), and as Kelly explained, most Argentinians like to keep a decent supply of USD. Once the currency issues had been resolved, we spent the afternoon acclimating. We ate dinner at Campo Bravo, where we were introduced to an Argentinian custom of only receiving two menus for the three of us, so that two people always had to share, which was fine, cute even, but a bit awkward. It was an oddity that we dismissed as random at first, but was repeated throughout the trip. We had a wonderful dinner of, you guessed it, parilla (food from the grill), and Malbec, along with some wonderful pasta casera (hand-made pasta). After dinner, we got ice cream at Kelly’s go-to heladeria. 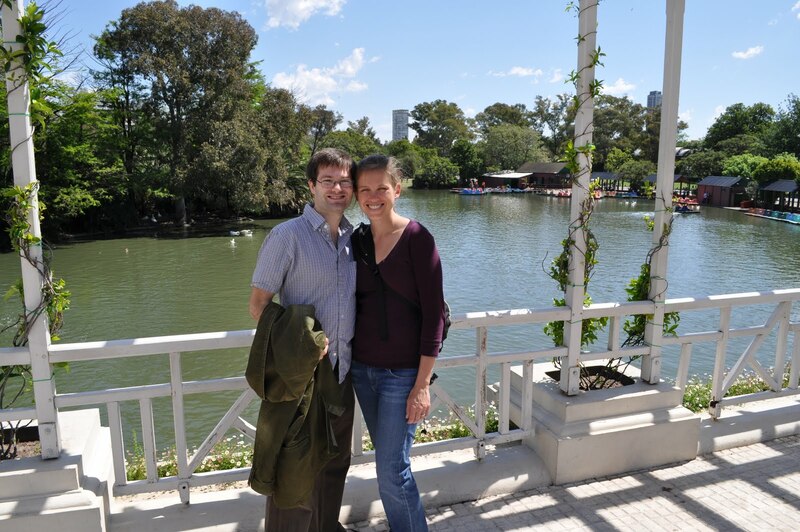 We had brunch in Recoleta and then spent most of the afternoon wondering around Kelly’s favorite open-air fair. Afterwards, we made the obligatory trip to Cementerio de la Recoleta. 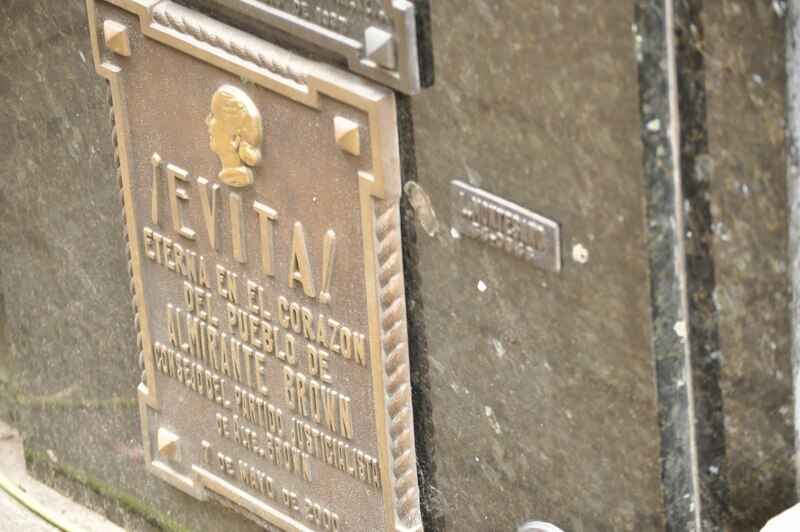 Where we saw the graves of both Eva Peron (Evita) and Domingo F. Sarmiento — one of the most progressive Argentinian presidents. We had an early evening reservation for wine tasting at Anuva wines — which was a highlight of the trip for me. We learned that Mendoza had excellent years in 2002 and 2006 and wines from that region are great bets in those vintages, though they can be very hard to find, especially in the states. Wines from Mendoza generally age for only about 10 years, so the 02s are on their last legs. We also learned that in addition to Malbecs and Torrontes, Argentina makes excellent Bonarda and Chardonnay, particularly in Mendoza, but also in Patagonia and other areas. Following our wine tasting/drinking, we went to La Cabrera, “Uno de los mejores secretos guardados en Palermo” (one of the best kept secrets in Palermo), for one of the best steak dinners ever — though I think the secret is out. 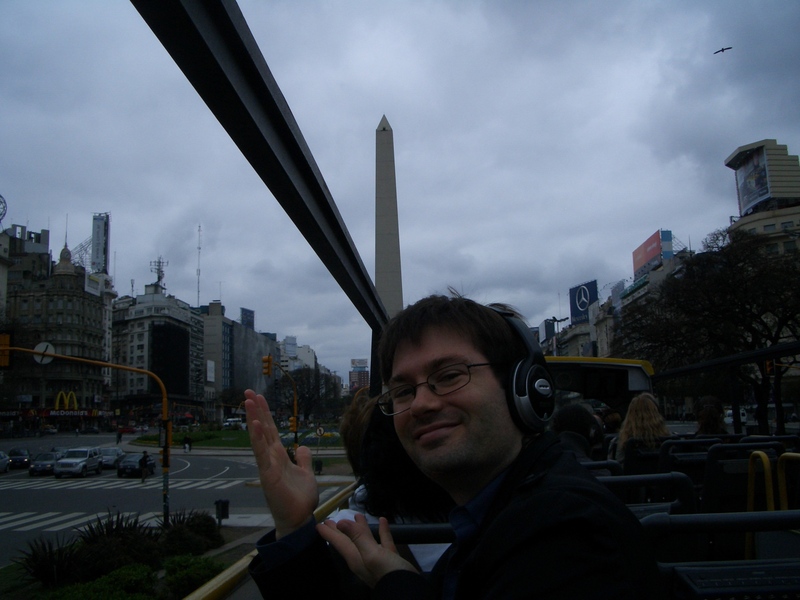 We took the autobus touristico (tourist bus) around the city. The bus provides headphones that you can plug into a variety of jacks so that you can hear the city tour in your language (English, French, German, Spanish, etc.). We got to see the Obelisco, which commemorates four events important to Argentina’s independence from Spain, Plaza de Mayo, named because Argentina declared independence from Spain in May (of 1810), and La Casa Rosada (the pink house), Argentina’s version of our White House, though la presidenta only works there, but does not live there. The house is rose-colored because there were two primary political parties when it was constructed — one used the color red and one used the color white and the colors were mixed to diffuse political strife. La casa rosa is asymmetrical, which I heard them say on tour, but because we switched buses in our effort to get to La Boca, we were, by that time, on a Spanish-only bus and I couldn’t understand the explanation for the asymmetrical presidential house. Further internet research suggests that it’s asymmetrical structure is because two buildings — an original governmental building and a post office, were merged to create the pink house. 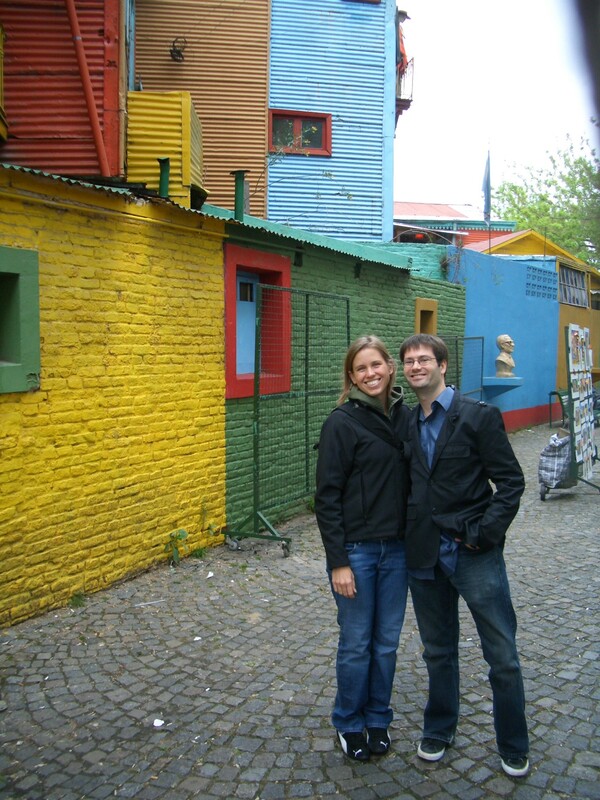 We disembarked the tourist bus in La Boca — the neighborhood pictured in most quintessential Argentinian postcards. We tried to find a restaurant in the area that had been recommended by a friend, but police turned us back toward the tourist area because “van a robarle” (those guys will rob you, using the cognate for our benefit). 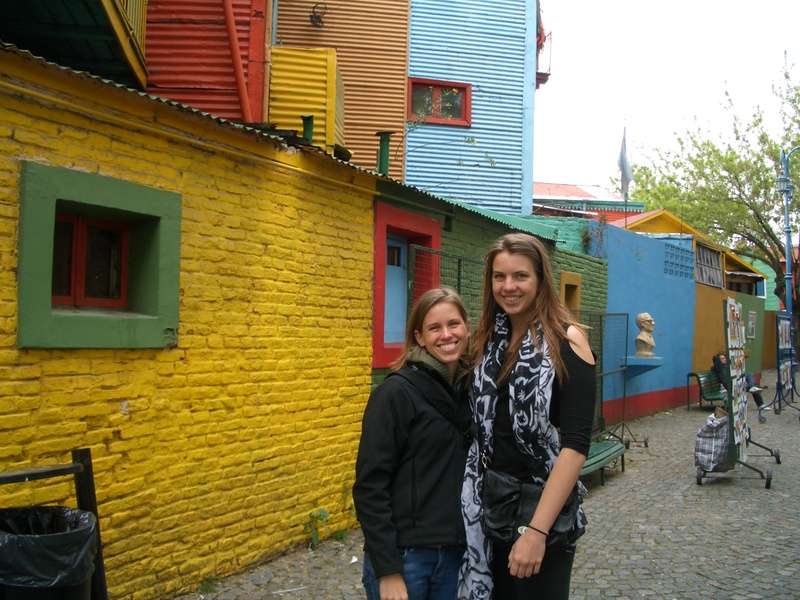 La Boca is one of the not-so-safe areas of the city. Once turned around, we got into a cab, but the cabbie was kind enough to inform us that our restaurant was closed that day, so we ate lunch in the tourist square, while watching a couple of tango shows. We then took a cab to San Telmo — the “true birthplace of tango” where we again sat at a cafe and watched a tango show in the square. 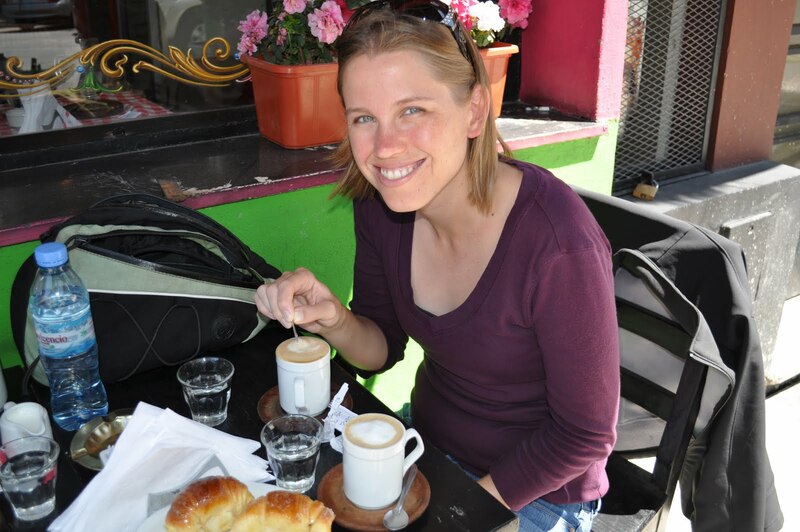 At this point in our trip, Kelly had introduced us to the Porteno drink, un submarino. Portenos are people from Buenos Aires and submarinos are one of the things on that long list of things called, “where has this been all my life?” It’s a large (preferably clear) glass of warm, frothed milk, served with a 4-6 oz serving of high-quality dark chocolate. The chocolate is your “submarine.” Drop it in, stir it up, and vuala — “hot chocolate,” Argentina style. Now thoroughly chilled from our outdoor seating throughout a cloudy, 50-something degree day, we headed back to our apartment. And Kelly, bless her heart, suffering from “I’m a poor study-abroad student” syndrom, suggested that we take the collectivo bus back to our neighborhood. It only cost about a quarter and took about 45 minutes, but we were so cold and tired from the day that it was difficult to stand up the whole time. The moral of this story — when in Buenos Aires, take a cab, just look for one of the “Radio Taxis“, which are better regulated by the government. The cabs, of all things, really are pretty cheap and standing, tired and cold, for 45 minutes, probably isn’t worth it. Another thing about Buenos Aires — Portenos take their “siestas” seriously. Most shops are closed between 2PM and 6PM and most restaurants are closed between 5PM (the end of lunch) and 8PM (the beginning of dinner). So, when you get back to your neighborhood around 5PM, don’t be surprised when EVERYTHING is closed. 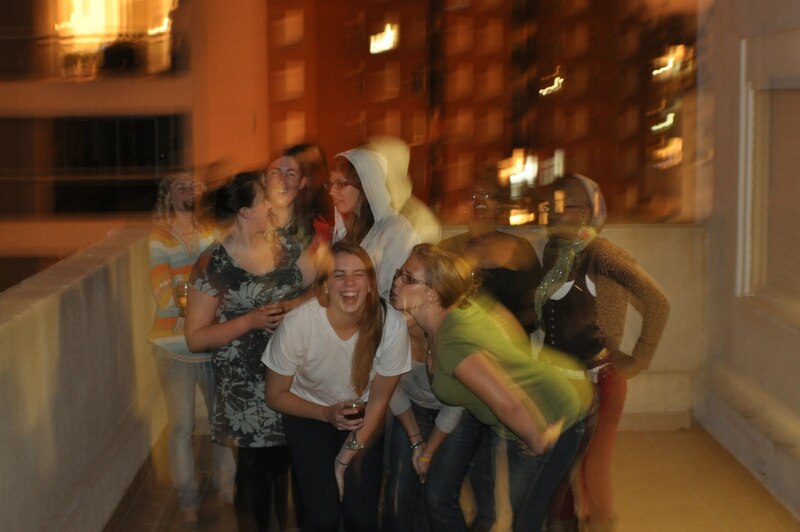 But on this day, a siesta suited us just fine, and we pulled on our hoodies, turned up the heat in the apartment and napped before dinner at one of Kelly’s favorite restaurants, Novecento . Kelly went to class and Dan and I had an “old-person day.” We took a cab to the Museo de Arte Latinoamericano de Buenos Aires – MALBA, which provided a beautiful, sunny, outdoor area for our morning cafe. Argentina gives Italy a run for their money with their cafes — espressos, lattes, cappuccinos, cafe americanos con leche (our go-to) — all are excellent. But, what really gives Argentina an edge is that a coffee is never, ever served alone. By default, it comes with a cookie (yes, a cookie), and a shot-glass-sized agua con gas (sparkling water is the default and you must specify if you prefer aqua sin gas — but who would?). However, while the MALBA has an excellent cafe, the MALBA is closed on Tuesdays. After the security guard turned us away, we looked to our trusted Lonely Planet Travel Guide and Dan found another art museum — Colleccion De Arte Amalia Lacroze De Fortabat. We took another cab across Buenos Aires traffic to this museum, which had the added benefit of being located on Puerto Madero, a beautiful section of the city that we hadn’t been able to see on our tourist day the day before. The art collection at the museum was impressive and the views of the port were distracting. 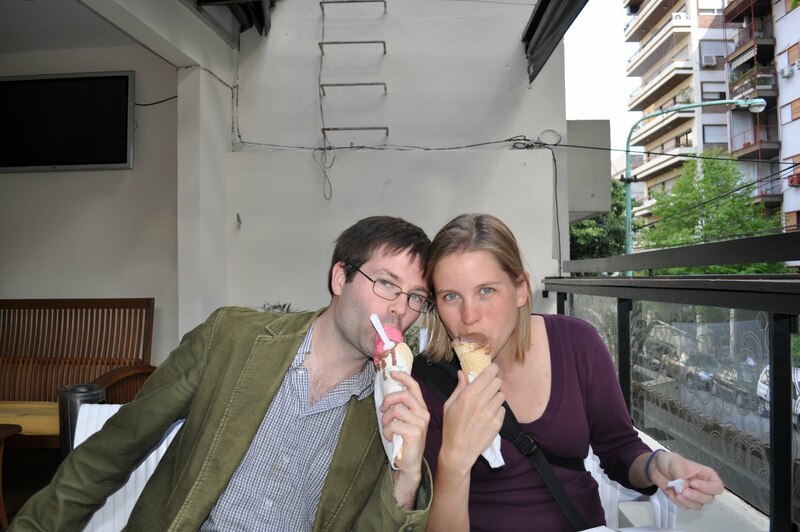 Once we had run through the four floors of art, we walked along the port and got a helado, because, as we had read in Lonely Planet, social etiquette required being seen eating ice cream at all times. After a walk along the port, we grabbed another taxi back to the supermarket by our house in order to pick up provisions for Kelly’s birthday party. 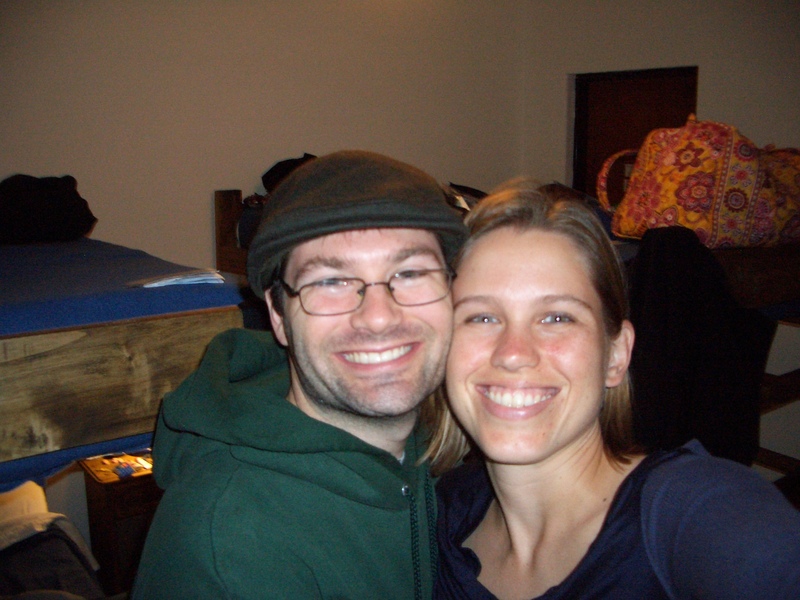 Our rented apartment had a great kitchen and Kelly had a bunch of study-abroad friends who hadn’t felt at home in a living room or had a home-cooked American meal in a long time, so we planned to make a dinner of vegetarian pasta for her friends. The party was excellent. Kelly’s friends were a riot, the pasta was decent and full of vegetables that were much cheaper in Buenos Aires than in the states, there was a hilarious roast accompanied by guitar and the essential ingredient to a 21st birthday party — dancing in the living room. 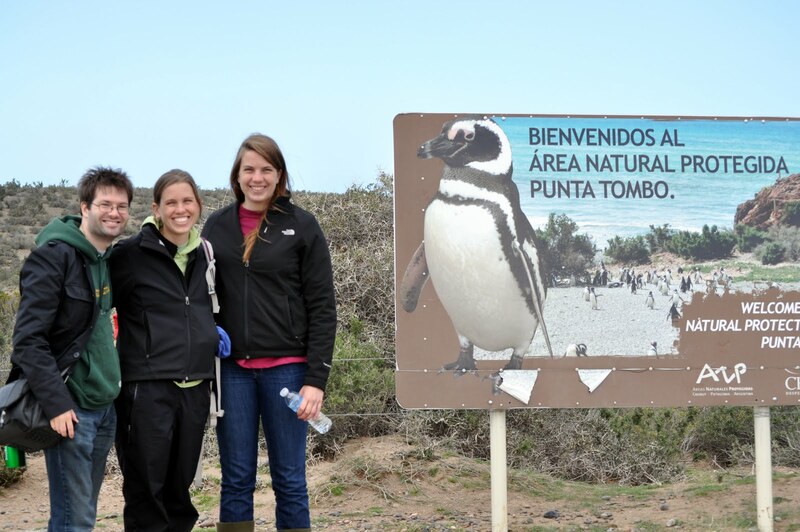 On Wednesday, we headed to Patagonia to see los pinguinos (penguins). We had considered the twenty-hour bus ride, but we were happy with our decision to take the two hour flight instead. I was allowed to carry my cafe para llevar (to go) through the metal detector at security once the guard took a look in the cup — out of curiosity more than anything — Argentinians mostly don’t take their coffee to go — yelling at a barista, paying with a debit card and rushing out the door is generally not part of their culture, and consequently, simple morning coffee breaks often take at least an hour. We arrived into a cold and rainy Puerto Madryn. Our transport dropped us at our hostel, we were shown to our room, and I put on my long underwear — I didn’t take them off for two days, even though yes, it is spring there. We stayed at Chepatagonia hostel — the room was clean and well-priced, but what really made the place was the knowledgeable and helpful owners. Maru gave us a map and helped us orient ourselves in the city. 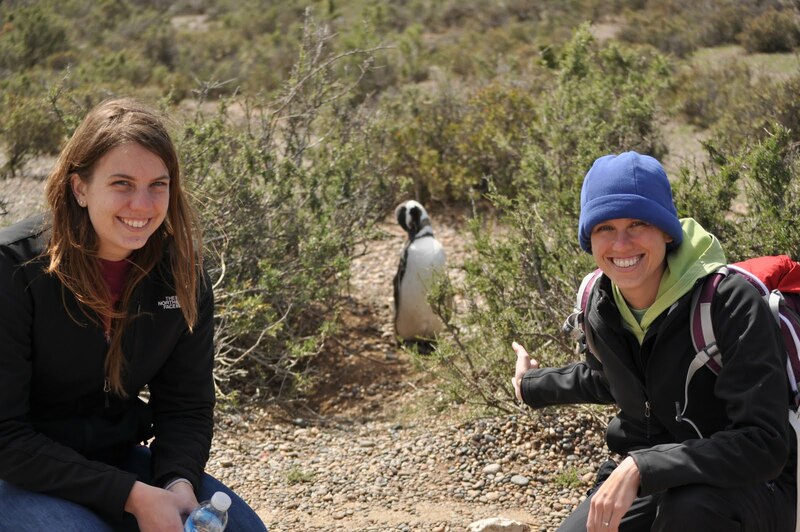 She described the various tours to see the wildlife and set us up with a tour to Punta Tombo the next day. 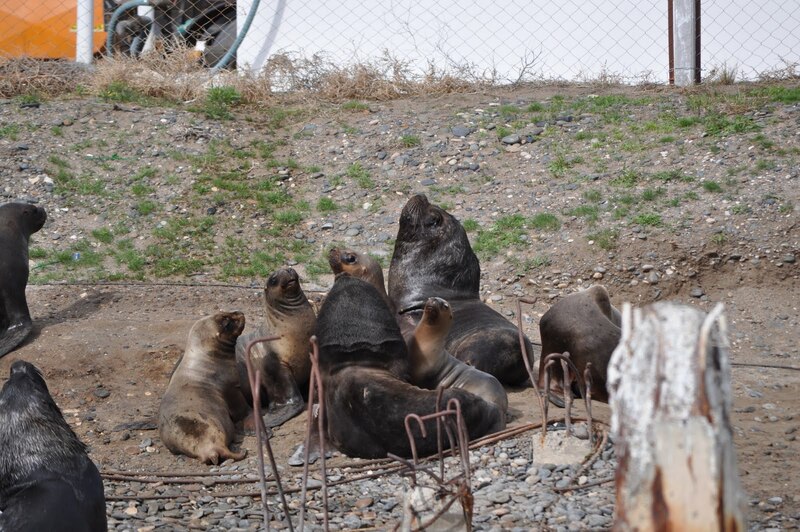 Thursday — Sea lions, Dolphins, Penguins, and Llamas, Oh My! 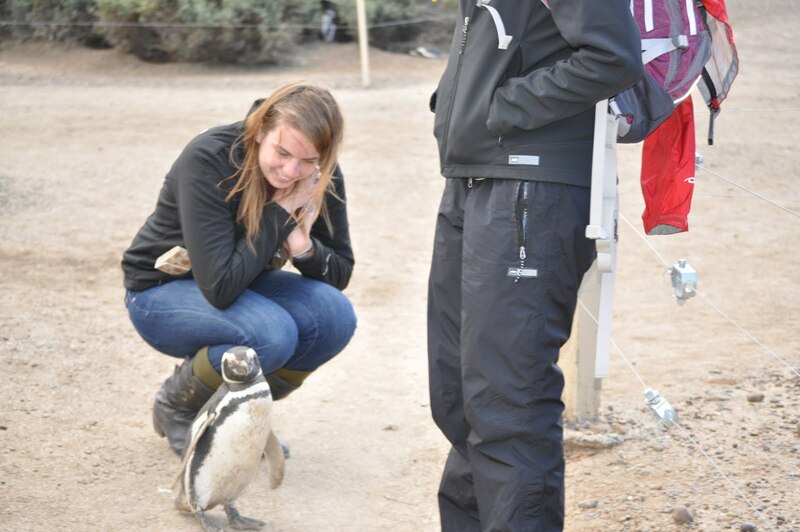 Penguin Day. Our tour guide picked us up from the hostel at 8:00AM. 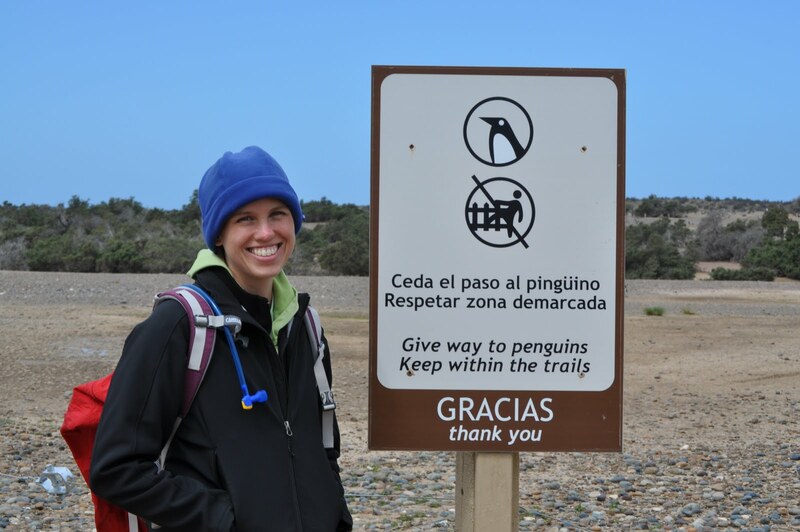 We stopped in Rawson to see some dolphins and bonus sea lions on our way to Punta Tombo — the protected nature reserve where each year, about a million magallan penguins make their nests and hatch their chicks, right next to the walking trail. 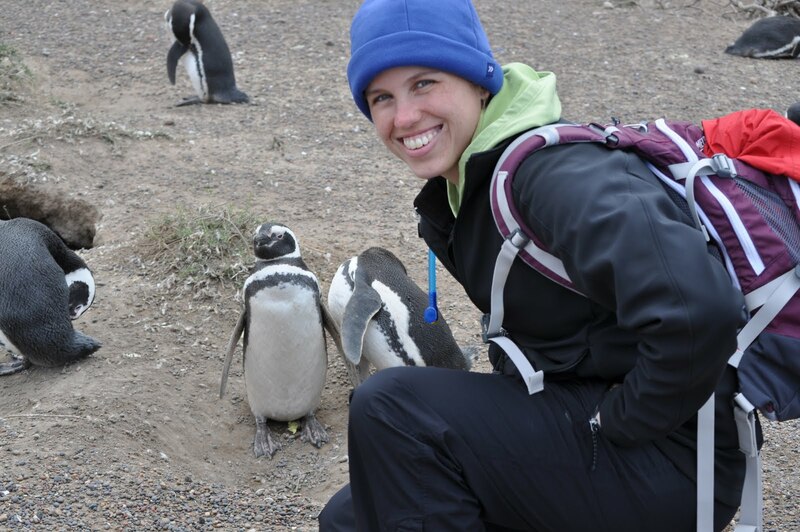 We arrived about two weeks after the females had arrived, who followed the males by 2-4 weeks in order to give the males an opportunity to (re)claim or build their nests. 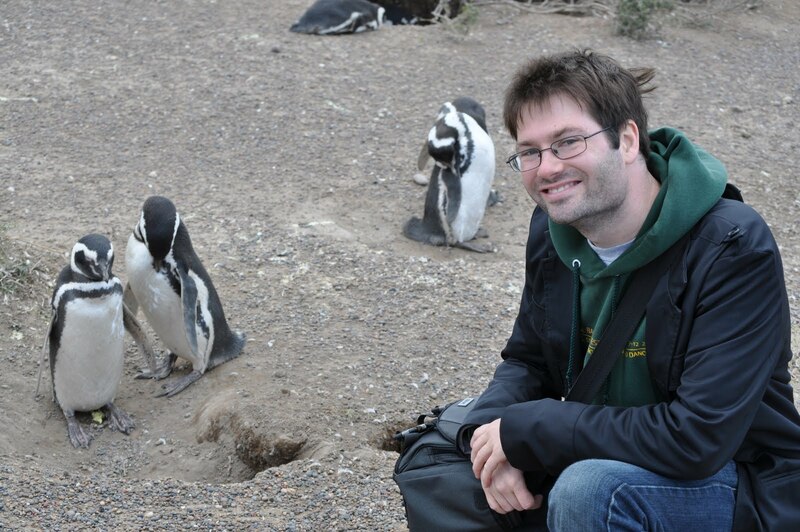 Penguins are serially monogamous and they had mostly coupled up for the year. A few couples had already laid eggs. 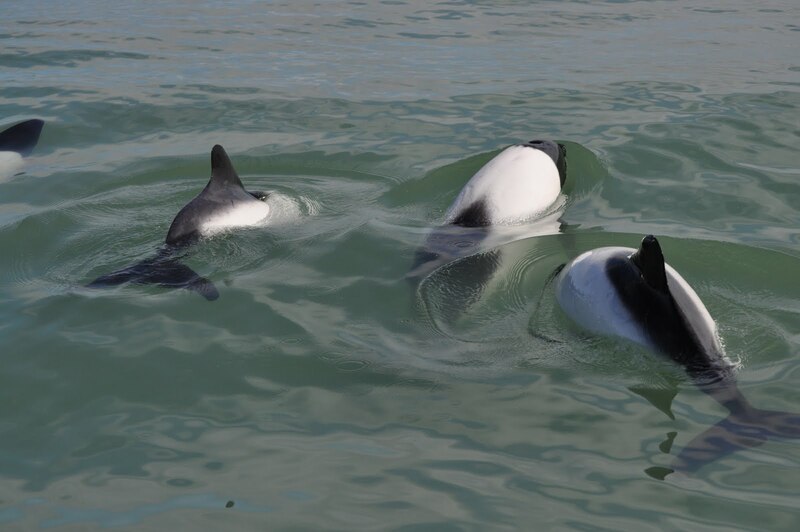 The males and females take turns sitting on the eggs while their partner walks up to a half-mile to the ocean to hunt for fish. 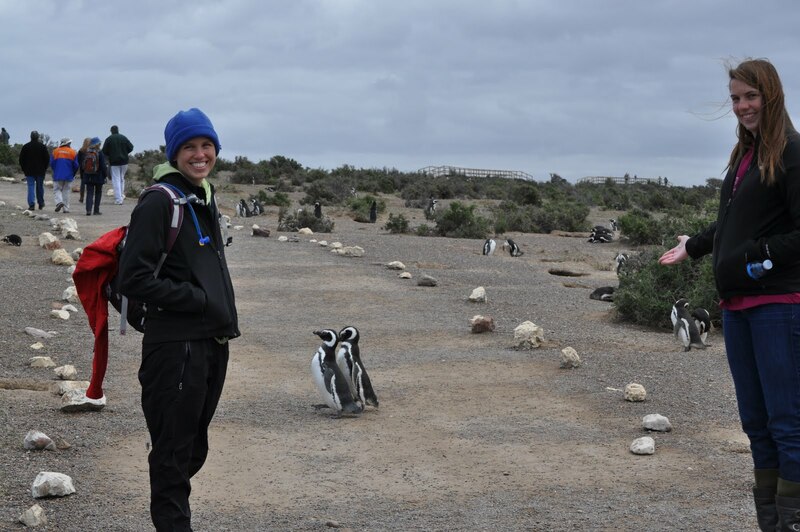 The eggs will hatch in the next couple of months and in March, all of the penguins will make their way to the sea. They won’t touch land again until next August. 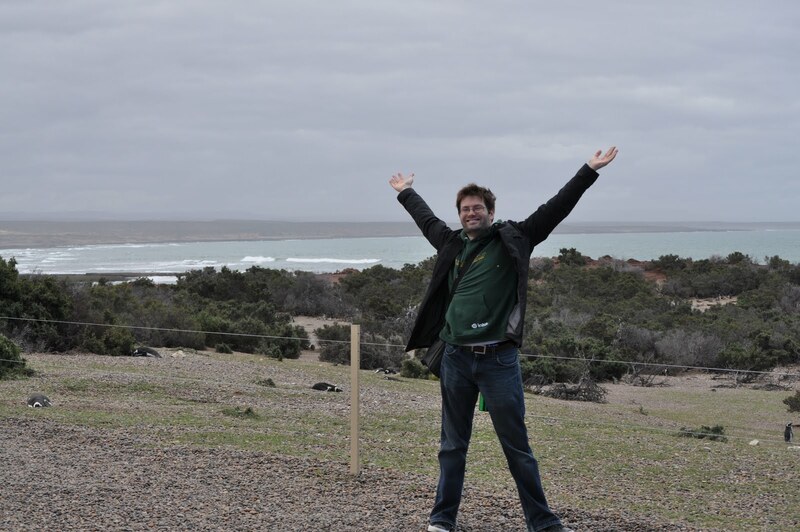 Once we returned to Puerto Madryn, Dan and I walked on the cold and windy beach for a bit and then we all got ready for an upscale dinner at Placido — which gave me an opportunity to try the famous Patagonian lamb, which I had heard a lot about but found fairly standard; the restaurant was nice overall. Friday — alfajores, alfajores, alfajores and a whale. Alfajores are the quinessential Argentinian treat — two cookies layered with dulce de leche and then, sometimes, covered with chocolate (white or dark), or merengue, or anything else you an imagine. I had tried one so far on the trip, but had decided that it was high time to try some more. So, Friday morning, we woke up, checked out and stored our bags at the hostel, and made a bee line for Havanna cafe — Havannas are ubiquitous in Argentina. We had our first alfajor with our coffee. We then proceeded to meander back towards our hostel stopping at every bakery on the way to try their alfajores. Though far from aficionados, we came to recognize the qualities that we most liked about alfajores and our preferred ratio of chocolate to cookie to dulce de leche. After our alfajor tasting, we walked along the beach, which had warmed up considerably under the bright sun. As we looked out across the ocean, we saw a whale. I saw the blowhole first but then we got a chance to see its back and tail fin. The whale sighting nicely completed the trip. We flew back to Buenas aires that afternoon. We used our last day in Argentina to get a taste of all of our favorite foods. The morning started off with a traditional cafe (with aqua con gas) and medialunas — breakfast croissants with which I’d fallen deeply and madly in love during our time in Argentina. They come plain, with chocolate chips or soaked in honey, but they are always good. Kelly then led us on a stroll through the largest park in Buenas Aires (similar to Central Park in New York City) and then to an empanada restaurant for lunch. After empanadas, we stopped at one last heladeria for hazelnut and chocolate ice cream. An amazing trip, made more amazing by Kelly’s expert guidance. But it did leave us wanting another week of vacation. 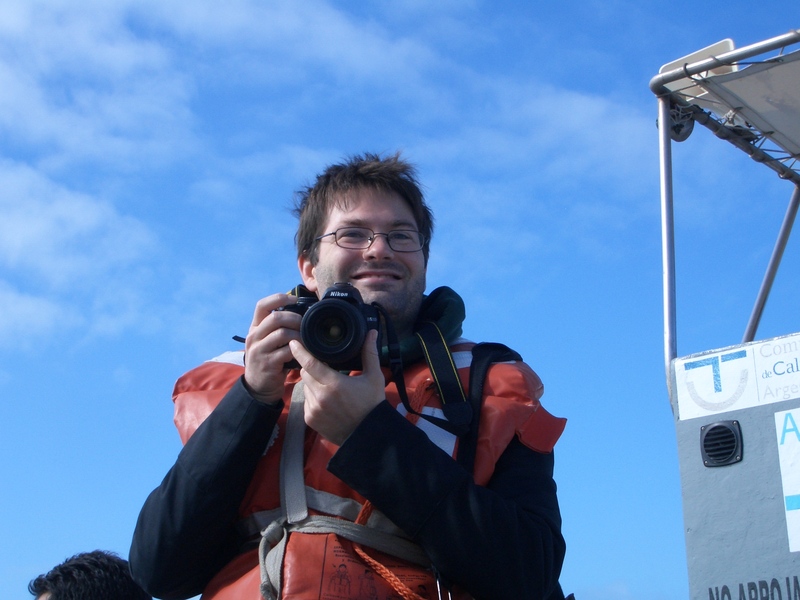 Dan made an excellent “best of” photo album with all of our best pictures from the trip.